Gastroparesis is a chronic condition in which your stomach empties very slowly. Normally, the stomach has a pump-like action that propels food onwards into your bowel. In gastroparesis, the pumping is weak or absent and food collects in your stomach. You may get nausea, vomiting, bloating, early fullness after meals, poor appetite and pain. These symptoms can vary from being mild to really severe. With severe gastroparesis, you may vomit several times daily, get dehydrated and need admission to hospital. You may get malnourished and lose weight, and you may need a feeding tube. Diabetic Gastroparesis: About 20-40% of diabetic patients have gastroparesis. Usually, diabetes has been present for many years, and you may have other complications of diabetes, like retinopathy (eye disease) or nephropathy (kidney disease). Post-Surgical Gastroparesis: You have developed gastroparesis after an operation on the stomach, like Nissen fundoplication for acid reflux. Idiopathic gastroparesis: You have gastroparesis without any known cause. The symptoms of gastroparesis overlap with those of simple indigestion (called functional dyspepsia). An endoscopy will show normal findings because there is no structural abnormality in gastroparesis. The diagnosis of gastroparesis is confirmed a nuclear medicine test called gastric scintigraphy or gastric emptying scan. You will be asked to eat a meal of scrambled eggs that has been labelled with a radioactive tracer. The time taken by the tracer to leave your stomach is analysed with specialised equipment and software. What is the medical treatment for gastroparesis? The treatment of gastroparesis depends on the severity of your symptoms. Mild symptoms can be treated by changes in your diet and medicines. But, severe symptoms can be very difficult to control. You may need placement of a feeding tube into your bowel for nourishment. Endoscopy and injection of Botox® into your pylorus (the valve that controls the outlet of the stomach) may help but the benefit usually lasts for few months only. Can gastroparesis be treated by surgery? Gastric Electrical Stimulation: Also called Stomach Pacemaker or gastric neuromodulation. Special technology called Enterra® is used to reduce the severity of your symptoms. Pyloroplasty: Using keyhole surgery, the outlet of the stomach – the pylorus – is made wider. Near-Total Gastrectomy or Gastric Bypass: The small bowel is joined to the uppermost portion of your stomach so that food can pass directly into the bowel. The remainder of your stomach can either be left in place or be taken out. What is a stomach pacemaker for gastroparesis? 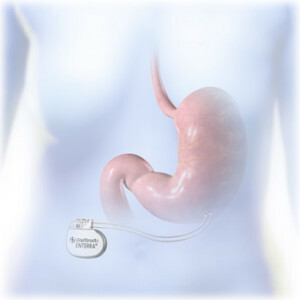 Treatment of gastroparesis by a stomach pacemaker is called Gastric Electrical Stimulation or Gastric Neuromodulation. The technology is called Enterra®. By laparoscopy (keyhole surgery), two electrodes (wires) are placed on the wall of your stomach. The wires are connected to the pulse generator (the pacemaker box), which is placed beneath the skin on your abdomen (tummy). The pacemaker is about the size of a large pocket-watch. What is the follow-up after placement of a stomach pacemaker? The response to the stomach pacemaker is variable. You may have improvement in symptoms soon after placement of the pacemaker. Or, you may not get any response until the pacemaker programme has been adjusted. The adjustment is done using a programmer that communicates with the pacemaker by wireless technology. The programming takes only few minutes and is done in the outpatient clinic. Mr Sarela has been doing stomach pacemaker surgery in Leeds since 2010. What is the success of a stomach pacemaker? A 50% improvement in your symptoms is taken as a good response to treatment by gastric electrical stimulation. Different studies have reported different success rates. About 60-75% of patients have good response to a stomach pacemaker. Please see the information from NICE and Medtronics for more detail.